Usually, Wal-Mart rules on Thanksgiving, with Amazon taking the lead on Cyber Monday. 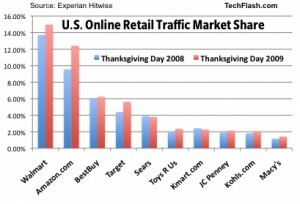 This story and chart indicates Amazon is closing the gap on Turkey Day. Either way, they’re both making a boatload of cash. » Who won Cyber Monday Stakes?